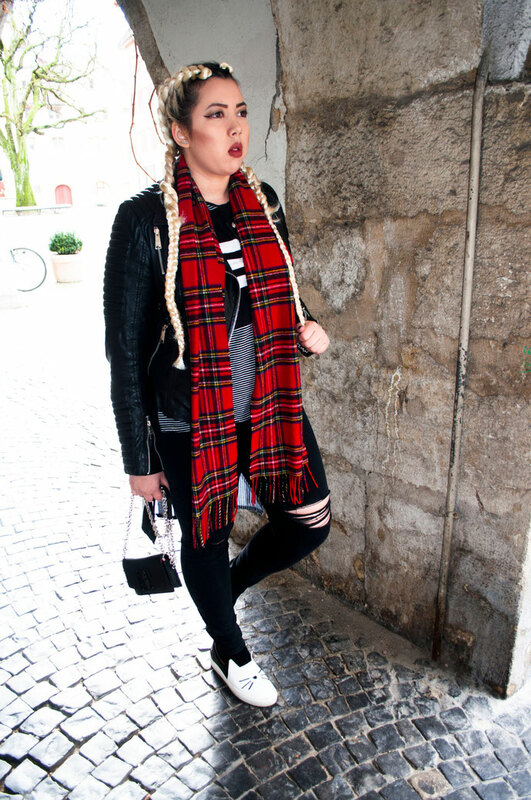 Rocking Ballerina. - cocoroxic - Swiss Style Blog. 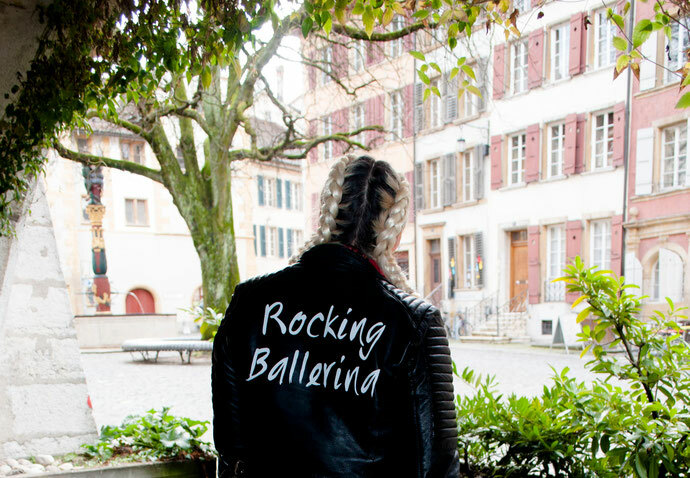 A rocking ballerina rocks it all year round.. Spring, summer, autumn, winter, it doesn't really matter because a classic biker leather jacket will always be welcomed. 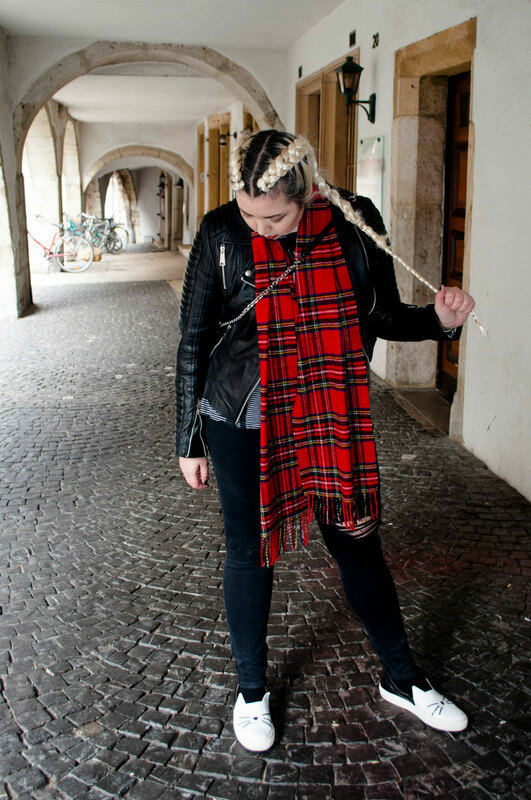 Some might think I'm bloody crazy right now for posting pictures of me wearing this leather lovie by Raine and a tartan scarf tight around my neck but those who know where I live, also know why anyone in my country would walk around like that. I guess Switzerland has one of the most bipolar weather, if you want to say so. And summer? Almost doesn't exist. It's either so hot you can barely breathe or it's just constantly raining and making you feel like you are one of the lost brothers and sisters of England, the land that is stereotypically known for its generous rainy days and bipolar climate too. I'm really not complaining though since I am a silent lover of the cold weather.. and of rain and its calming sound which always manages to sooth my soul ever so beautifully. I just love wrapping myself up, you know? The more I wear, the more comfortable I feel. Wrap me into clothes, scarfs, jackets, blankets and more and make me look like a living and breathing burrito and I wouldn't care as long as I feel good and safe and happy. And I guess that's basically my message this time.. for you to always make sure you feel good about yourself, no matter what you are wearing and no matter how your body is built or what kind of figure you might have. Just make sure it makes you /feel/ beautiful. Because if you feel beautiful you automatically appear beautiful for everyone else too. Make sure it makes you feel special and make sure you always wear a smile in addition because honestly? That's all you'll ever need to do to shine bright in your own magic of attractiveness. Let people judge you, and let them stare but never let them change you. Its about and your well-being. Its about you and your emotions. Loving yourself isn't selfish, but important.. So, if you want to wear your fluffy winter coat over some tank top or some shirt with an awesome print of it in summer, just do it.. but make sure you pack a bottle of water with you just in case you're about to melt in your stylish hotness. You brought good stuff into this content which I admire greatly. Like in social media and all, this will really work. Thanks for the sharing. That jacket looks very badass, to be honest. And I say that as one of the best essay writing people in the whole world. So, you must know how big of a compliment that is coming from me. I would love to wear this.